A Politics and Economics graduate, Vannadil Pudiyaveettil Dhananjayan joined Kalakshetra on 5th October 1953. 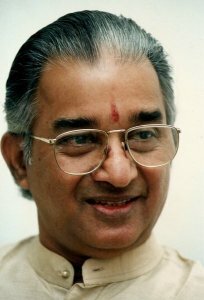 He has a Post Graduate Diploma in Dance (Bharatanatyam and Kathakali) with distinction from Kalakshetra, Chennai, and was a leading male dancer under Rukmini Devi from 1955 to 1967. VP Dhananjayan and his wife Shanta Dhananjayan, popularly known as The Dhananjayans, founded Bharata Kalanjali in 1968. From a modest start to establishing their own dance academy, it has been a story of deep commitment, fervor and dedication. Bharata Kalanjali has emerged as a full-fledged academy of dance and music with a repertory fashioned out of its own students and graduates, who have established themselves in different parts of the world. The Dhananjayans received the Padma Bhushan Award on March 31, 2009 for development, preservation and propagation of the best of Kalakshetra tradition of Bharatanatyam through their dance academy Bharata Kalanjali. Dhananjayan has served as the honorary founder secretary of ABHAI (Association of Bharatanatyam Artistes of India) and completed 2 terms as its President. He has authored a book on Bharatanatyam apart from contributing numerous articles on dance and social issues. His book 'A Dancer On Dance' strives to create an awareness of dance and its related problems to contemporary society. He is a guide and counselor to numerous dance organizations. The 15th Natya Kala Conference titled "Purush: The male in dance" was convened by Dhananjayan in December 1995. He has always voiced his concern about the plight of the male dancer in India. Whenever he is on a public platform, he is known to speak out on what ails Indian dance and culture today and has a reputation for being forthright in his views. As more male dancers are becoming solo artistes, what do you think it means to "dance like a man" in Bharatanatyam? How has your training in Kathakali enhanced your performance of Bharatanatyam? What should young dancers keep in mind if they choose to learn more than one style of dance? Kathakali training certainly makes a man dance like man, and with the body, mental, and spiritual discipline that we get from Kathakali training, one gets completeness. My success as a Bharatanatyam performer is my judicious amalgamation of both styles. Certain combination of styles gel well, but some do not. So, one must be very cautious of learning more than one style. What were some of the initial difficulties you encountered after graduating from Kalakshetra? Were you pressured to take up a more secure profession? Initially I had to take up a clerical job to support the family and slowly work to build up a career in Arts. I had to face regional, caste, religious, and gender differentiation from the so called patrons of art, but over the years I was able to cross over all such difficulties and emerged successfully as a Bharatanatyam performer, teacher and choreographer. Also, I started my career presenting group presentations for earnings, and then slowly broke through the women's domain to steal the limelight. God has been very kind to me through the true rasikas who really got me the honour I enjoy today as a male Bharatanatyam performer. I have no regrets. What is a hobby that you enjoy doing in your spare time? I spend my spare time (if there is anything like that) in writing and listening to good music.